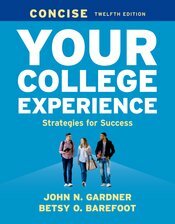 This less expensive, streamlined edition of Your College Experience presents a straightforward, realistic, and intelligent review of the skills students need to succeed in college. The text focuses on the academic skills taught in college success courses while additional coverage of emotional intelligence, learning styles, diversity, and money help students get off to a great start. While maintaining its hallmark theme of goal setting, the new edition provides practical strategies across all topics of the book to help students be successful from the start. The book features a fresh new design and a strong new emphasis on the ten research-based High Impact Practices suggested by the American Association of Colleges and Universities. Chapters on Emotional Intelligence and Thinking have been thoroughly updated with tools and strategies students use on campus right now.